A Static IP address is a fixed IP address that should be set up on a computer or router in order to acquire Internet access. Some subscribers have a Static IP account that requires them to enter their Static IP credentials provided by their Internet Service Providers (ISPs) to a computer or router. This article helps you to set up a Static IP connection on your F5D or F6D Belkin router. 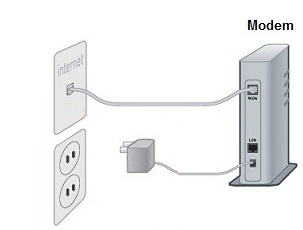 Before you begin, make sure that there is an active Internet connection when you connect the computer directly to the modem using an Ethernet cable. Check if you can go online using the Static IP address on your computer. If not, contact your ISP. Unplug your modem's power cord. Connect the modem to the router's WAN or Internet port. Connect a computer to any of the numbered ports (1, 2, 3 or 4). If you are using a wireless computer, you will need to connect it first with an Ethernet cable. NOTE: The back of your router may look different depending on its model. For more examples, click here. Plug in your modem and router's power cord. Open any web browser and enter "192.168.2.1" in the address bar and press [Enter]. 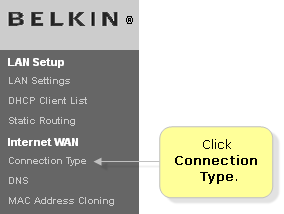 NOTE: The default IP address of a Belkin router is 192.168.2.1. If it doesn't work, check your router's IP address. For instructions, click here. Click Login on the upper right corner. 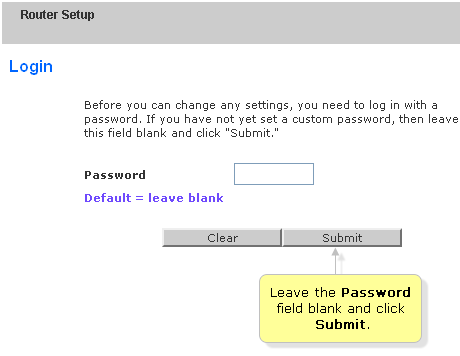 Leave the Password field blank and click Submit. NOTE: If you have customized the password of your router, use that instead. Select Static and then click Next. Enter the IP Address, Subnet Mask, and ISP Gateway Address provided by your ISP. Select Click here to enter your DNS Settings. Enter the Primary and Secondary DNS addresses as provided by your ISP then click . Click OK once a pop-up window appears. The router will then apply the changes that you have made. 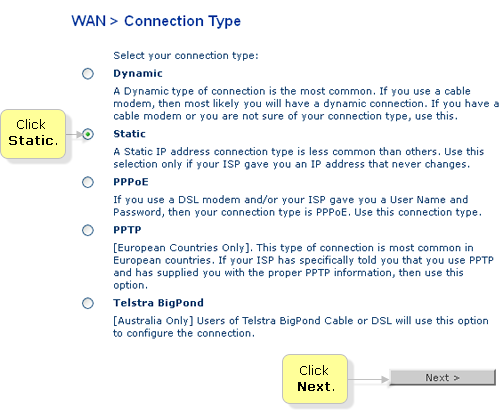 Check the Internet Status section at the top right corner of the setup page and make sure it is set to Connected. Verify that the computer is connected to the Internet by opening a web browser and visiting the Belkin website.